EXPERIENCE AND CAPTURE UNIQUE UNDERWATER MOMENTS: Get ready to dive and take the shoot the most amazing pictures and videos underwater! The AOKON wireless extreme action camera is 100% waterproof and you can safely take it with you underwater, reaching an astounding 30 meters depth! Now, you can make the most of your activities and impress everyone with your stunning underwater footage! ENJOY COUNTLESS POSSIBILITIES THANKS TO THE AMAZING FEATURES: The SJ7000 HD WIFI action camera is bound to serve all your needs! It is the perfect combination of high quality and low price which make it an affordable luxury for each and every one of you! This high-definition digital motion video recording device features a 170° wide angle lens, a remote control WIFI function, a 4x zoom, a 2.0” HD screen, 12M, 1080P and unlimited modes that will offer you endless possibilities! 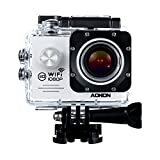 A MUST HAVE FOR EVERY SPORTS AND OUTDOORS ENTHUSIAST: Whether you like extreme sports, riding, diving, skating, climbing, skiing, surfing and flying or you just love outdoors experiences, this sports action shot video camera is a must have for you! It has been specially designed to withstand extreme conditions and it promises to never let you down. GET ALL YOU NEED IN A KIT: This top notch action sports helmet camera comes with 18 incomparably useful items. Each kit includes a waterproof case, a bicycle mount, 7 multi-function mounts, a camera clip, a helmet seat, bandages, 3M stickers, tethers, a wire rope, a USB cable, a lens cloth and a user manual too! What is more, upon placing your order, you are offered 2 powerful, rechargeable batteries. 100% RISK FREE PURCHASE: Meeting all your demands and providing you with the friendliest customer service is our number one goal. This is why we offer you a 100% money back guarantee in case this action video camera does not live up to your expectations. In addition, our products are backed by a 1 year warranty. Capture The Moment And Make Every Unique Experience Live Forever Thanks To The Best Action Camera! Are you the type of person who loves to live life to the fullest and enjoys outdoor activities? Would you like to be able to take high quality pictures and videos and keep your best memories and wildest experiences alive forever? The AOKON HD action sports camera is exactly what you have been looking for! With unparalleled overall performance compared to GoPro, and only at 1/3 of the price of a GoPro. Its 100% water resistant casing allow you to dive with your camera in up to 30 meters deep waters! The remote control WIFI action function allows you to easily operate it through your smart device. In addition, the 2.0 inch HD Screen, the 12 mega pixel shooting and the 170°wide-angle lens give you the opportunity to capture vivid, breath-taking pictures and videos. Last but not least, the astounding additional features such as digital video and sound recording, cyclic record, time lapse mode, motion detection, anti-shaking, car mode, adjustable exposure, battery saving mode and the 4x digital zoom provide you with countless possibilities! This amazing waterproof, helmet mount camera pack contains 18 extremely useful accessories! Along with the action sports camera you will receive a waterproof case, a camera clip, a bicycle mount, a helmet seat, a USB cable, 7 multifunction mounts, 2 batteries and more! Detailed user manual, gives you step by step instructions. This entry was posted in Discount Photography and tagged 1080p, 170°Wide, Accessories, Action, Angle, Aokon, Batteries, Camera, Helmet, lens, Motorcycle, Screen, Sports, Underwater, Video, Waterproof, White, WiFi, Zoom by Ball Photo. Bookmark the permalink.